Young Harry has a 100-year old friend. Even though one is very old and the other is very young, they are special friends who enjoy many of the same things. They learn from each other too. They wait for the school bus together. They enjoy the feel of the breeze and the warm sunshine. There is something that BOTH want to learn to do. Can you guess what it is? A natural springboard to compassion and respect and a welcome addition to 100-studies. Albert, a fourth grader, is uncomfortable around old people, but he really likes frogs, Grammy, and Mr. Spear, who helped him overcome his reading problem. With a message reminiscent of Tomie de Paola’s Now One Foot, Now the Other, this 58 page novel brings together youth and aging to demonstrate a unique bond that can form through respect, compassion, and courage. 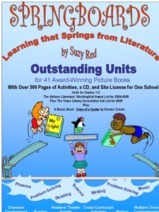 You can get Mr. George Baker and all 41 terrific literature guides in our Springboards download for less than $.50 each! We guarantee you will love it!